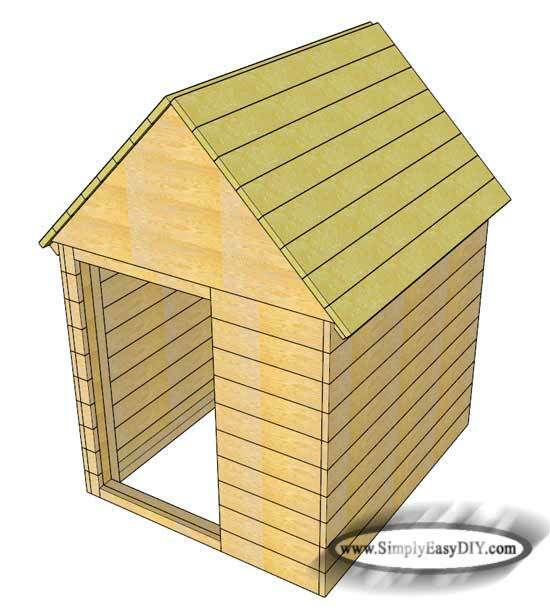 A chicken coop should be more than just a place for chickens to come home and roost. It should be something that you and anyone you host in your backyard should be proud to showcase. 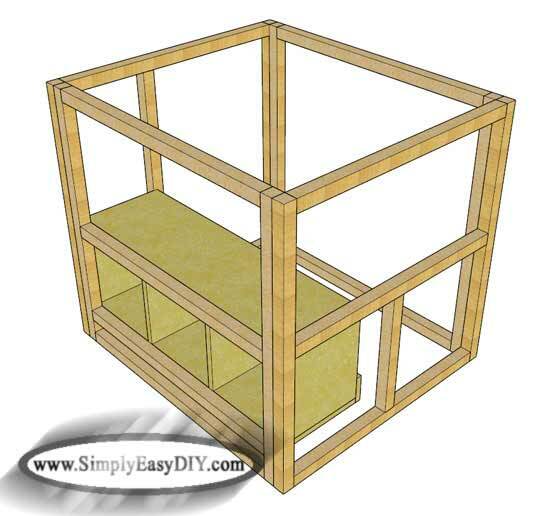 I built a small backyard chicken coop about a year ago that houses 2 to 4 chickens and can be easily transported in the back of a car. 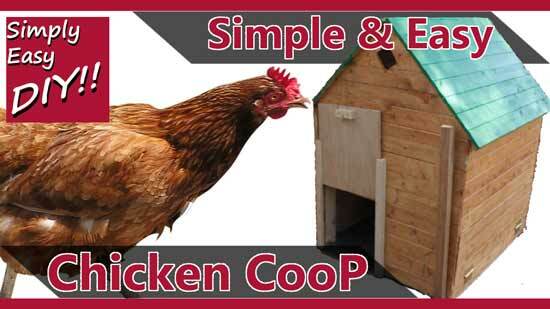 I did that because at the time we were moving and needed a coop that could pull double duty. Now we are moved. Hooray! Well, we are getting there. This new chicken coop will go a long way to completing the "settled" mission. 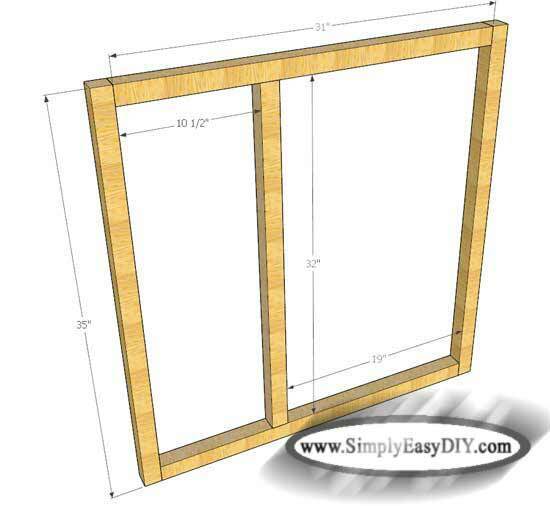 If you have purchased 2x4s in order to rip your own 2x2s then that would be your first step. 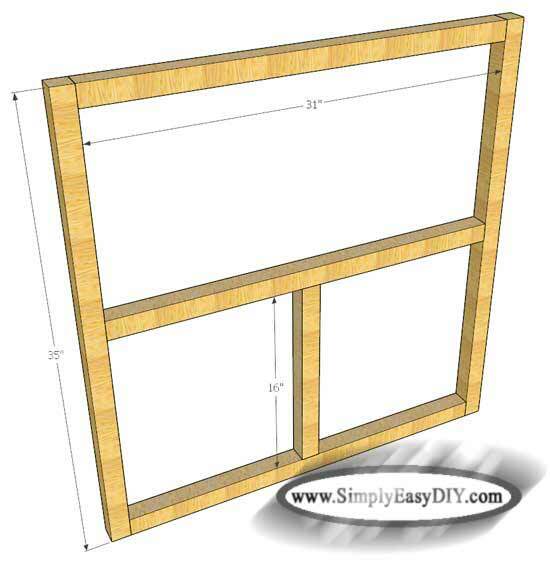 If you have decided to save time, if not money, and purchased 2x2s then cut all your framing pieces to length. Starting with the front frame assemble the four main sides using 3 inch screws. Then measure for the inside pieces. You can get away with one 3 inch screw for each side of the interior pieces. Repeat step 1 for the back frame. Repeat step 1 again for the two remaining side frames. Once all four sides are framed out it is time to attach them. 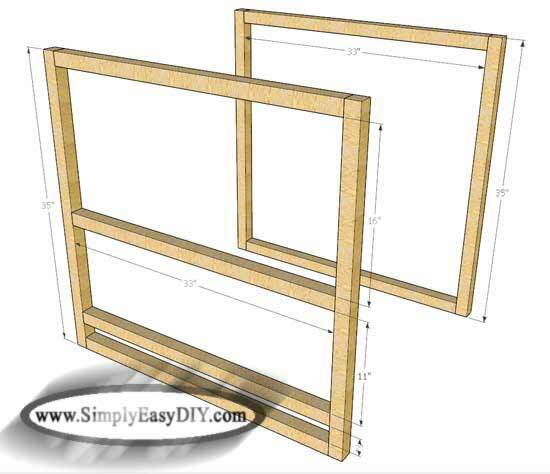 I clamped the frames together and then used 3 inch screws driven from the inside of the frame. This was done so that I could access the screws at some later time if needed. 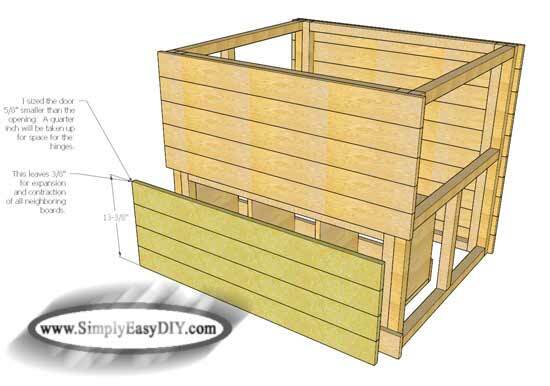 If you drive them in from the outside of the frame then the side slats would forever cover them up once you have attached them. I always try and keep future maintenance and/or repairs in mind when building a project like this. The nest boxes can be built next. I used pocket holes to assemble the unit as you can see in the video. Once the nest boxes are built they can be installed before the walls go up. I used some scrap 2x2s left over from framing in order to create some ledges that the nest boxes rest on. Driving 4 one and a half inch screws holds the boxes firmly in place. Note: Yes, the chickens will roost on top of the nest boxes at night. I am fine with this. 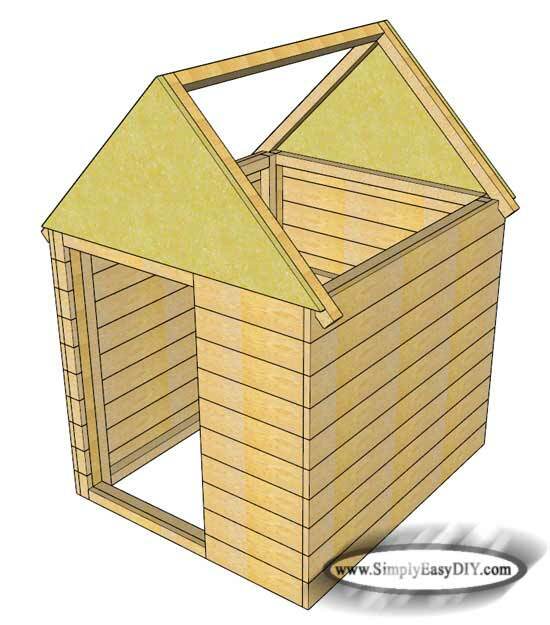 However, if you would like to keep your birds from roosting there then simply place a piece of lumber on top at an incline steep enough to keep them from doing so. 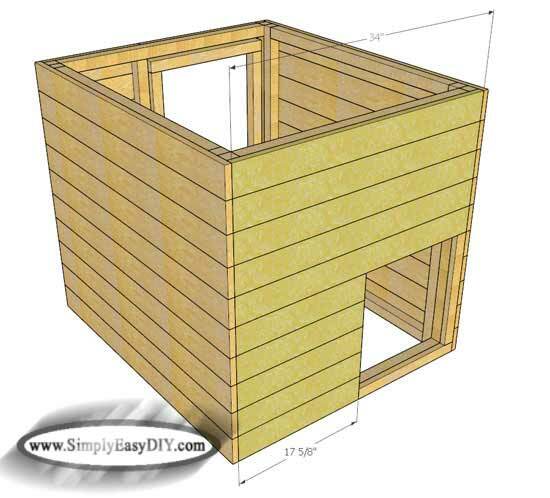 Placing the nest boxes on the inside of the coop instead of the outside makes the building aspect a little simpler. However, obviously it does take up a bit of space from inside the coop itself. Time for the walls. 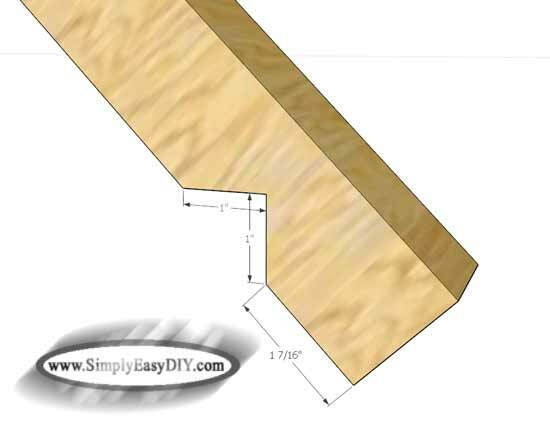 They are simple 1x4s cut to length. Some glue at each end and then nailed in place with 18 gauge one and a half inch nails holds them firmly. Note: If you have any gaps between the boards that you are not comfortable with, perhaps you live in a colder climate, then you can always come back with a water proof caulk to fill in those areas. However, choosing the right lumber products goes a long way toward not having to overcome issues like that. Same thing for the side with the nest boxes. Only do not cover the portion for the door. Time to go back to the shop and put together the door for the nests. Take a final measurement of the opening you have left. Then subtract 5/8". 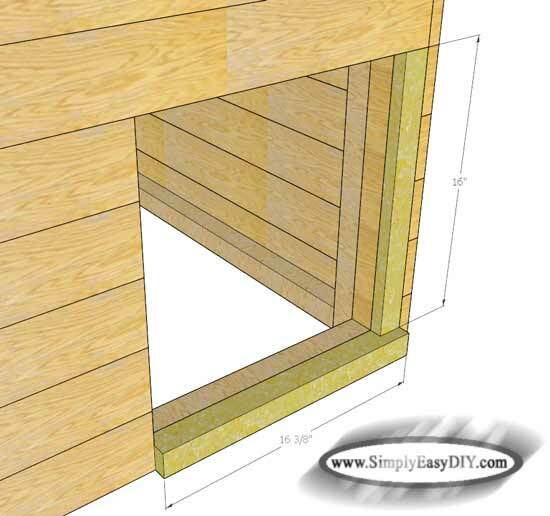 A quarter inch will be taken up by the space at the bottom of the door for the hinges. That leaves 3/8" at the top for expansion and contraction. That may seem like a bit much and indeed it is a little more than is usually left. 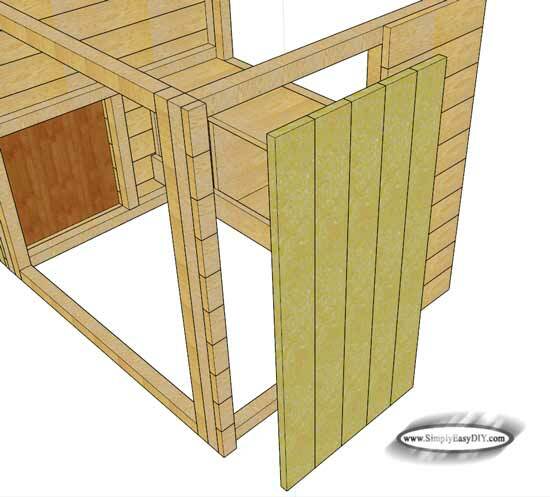 However, you do not want to go out to your chicken coop one day and find the boards have expanded a little more than you thought they might and not be able to open it in order to check for eggs. The times it has happened to me are the times I did not leave ample room for expansion and contraction. Since we have so many boards next to each other that effect will be amplified. 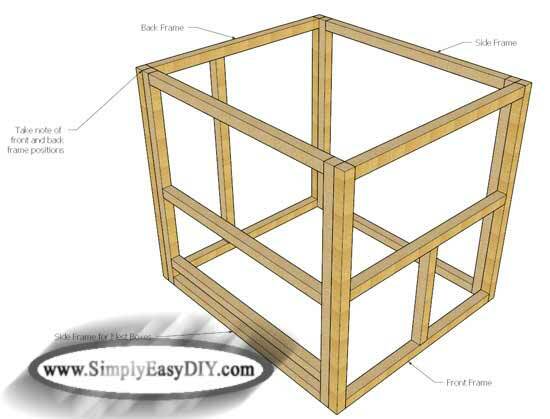 You will need some trim pieces to complete the opening for the chickens. A 1x2 cut to length for the vertical piece. A 2x2 cut to length for the bottom piece. Why the difference? Why not just use a 1x2 for both pieces? We need a ledge on the bottom to stop the door from falling all the way to the ground when it is lowered at night. 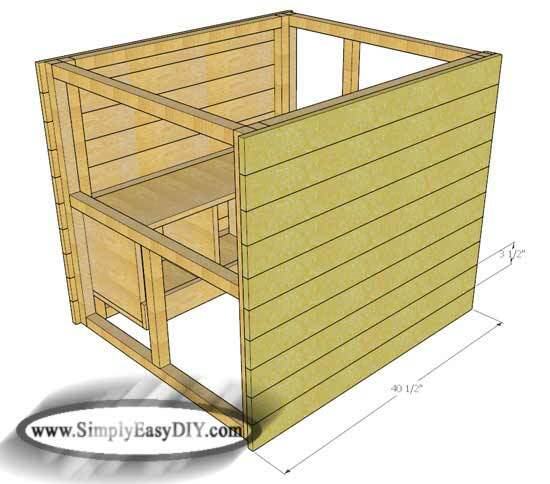 Add the slats to the back of the chicken coop. Time to work on the roof. I designed a traditional styled roof simply because I am not a big fan of the simpler lean to styled roof. 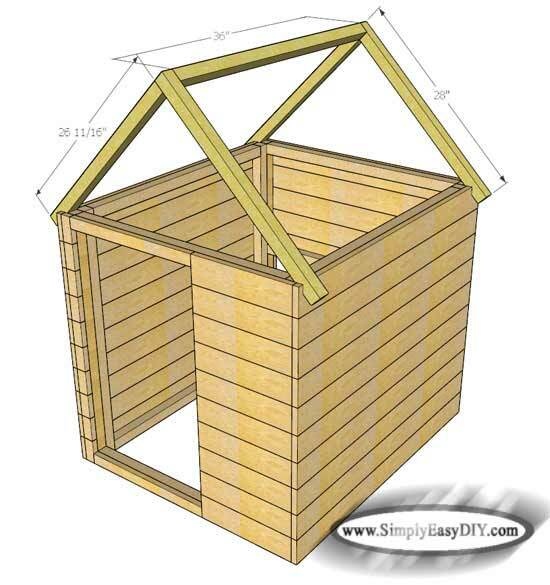 Yes, that means cutting a birds mouth in the trusses but not to worry, I have simplified the process. No complicated math formulas to calculate out. 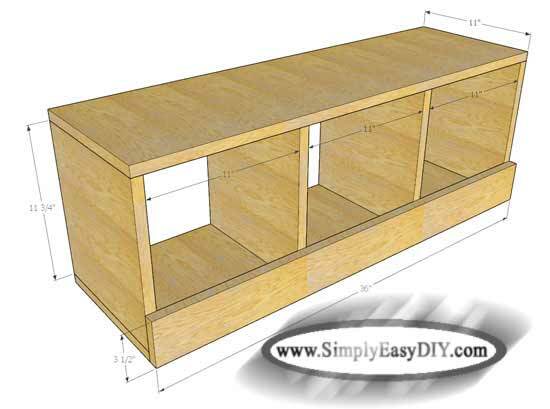 Simply measure up from one end by the indicated measurement. Then it is a simple matter of making two 45 degree cuts. refer to the video and pause it if you need to. Measure in one inch for the first 45 degree mark. Then simply flip your combination square over but stay on the same side of the board to make the second 45 degree mark. You can refer to the video for how I finished up the ends of the roof. I cut some 1x4s to only the exact length I needed for each tier. Then I took a jigsaw to flush cut the ends. I attached one side of the roof. Then I decided to take care of a few things such as cutting the ventilation holes and attaching a few roosts before finishing up the other side. You can refer to the video for a visual representation of the process. The rear door I decided to flip the direction of the boards to run up and down. This was done to break up the visual monotony of boards running horizontally around the whole coop. This was a personal preference that in no way hinders the functionality of the project if you choose to continue the horizontal aspect for continuity purposes. Finally the front door. 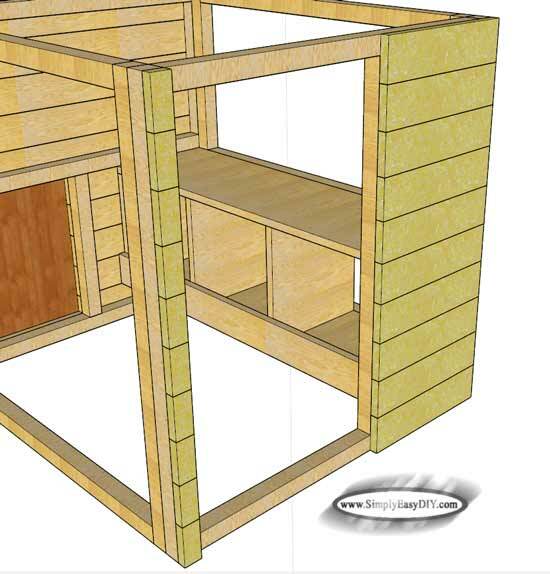 When I was designing this coop and decided that I wanted the nest boxes on the inside instead of the outside, it forced me to move the front and back doors to the side of the coop. 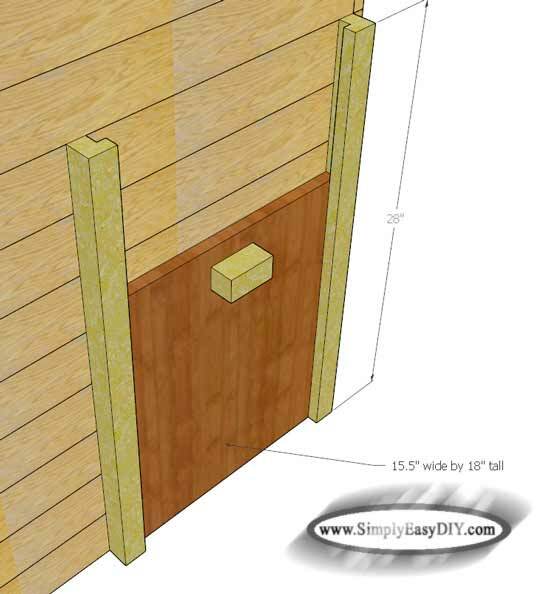 What I failed to consider was that the slope of the roof and the overhang of the slats would prevent me from attaching the guide rails for the door and still be able to slide the door into the groove of the rails from the top. The simple fix I came up with was to remove one of the rails. Fit the door in its place and then reattach the other side of the rail. This turned out to be a good thing in the end because the overhang of the roof slats actually prevents the door from being pulled to far up and out of its guide rails. 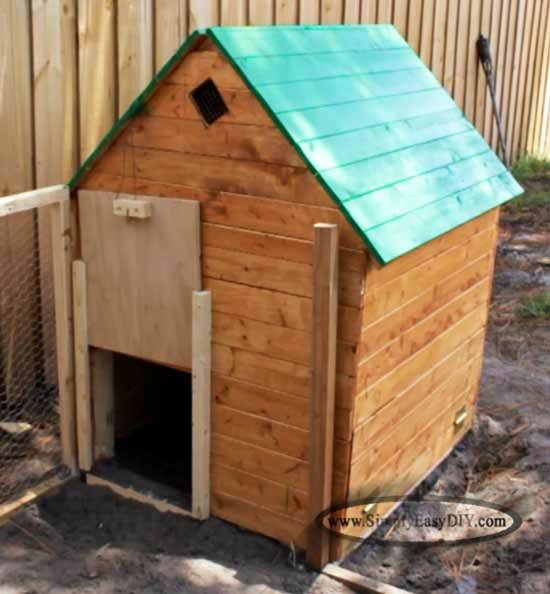 When you are all said and done your new chicken coop should look something like this. Obviously the color palate is personal preference. 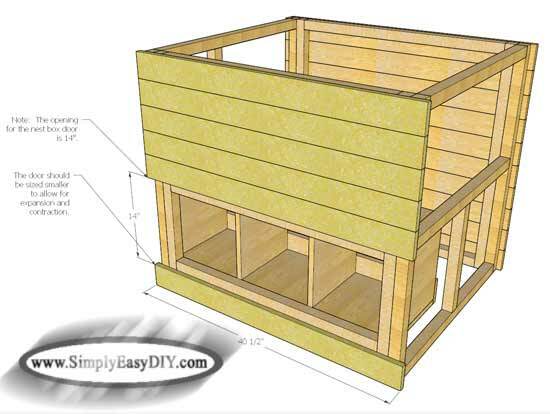 This hen house provides approximately 35 square feet of space with the pitch to the roof. I'm not here to provide guide lines as to how many chickens could be housed but I'm comfortable with 6 to 8 birds. If you like this project be sure to subscribe for email updates by using the form to the left. Also be sure to subscribe to my YouTube channel and never miss a new project video. I try to post new videos every week usually on Thursdays. Check me out on Facebook and Pinterest.